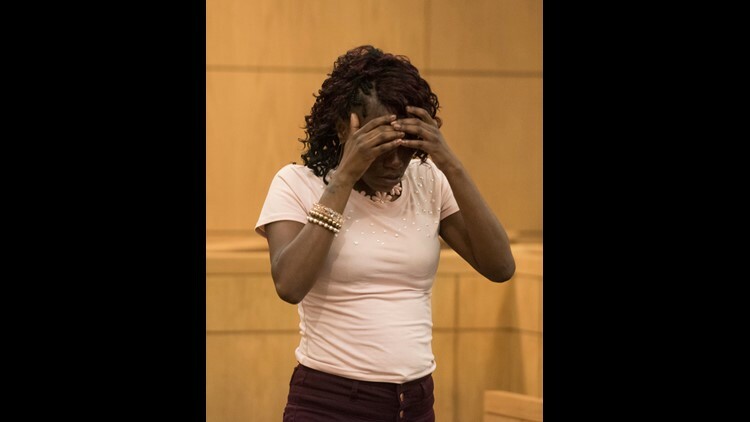 Louvenia Johnson reacts to her sentencing on Friday, Aug. 10, 2018, for her role in the death of Jai'Nier Barnes, who was left in a day care van in August 2017. Johnson received a sentence of 11 months in jail, followed by 10 years probation. PENSACOLA, Fla. – A day care employee who had a part in leaving a toddler in a hot van last summer was sentenced Friday. Louvenia Johnson, 29, pleaded no contest in June to aggravated manslaughter of a child by culpable negligence, only days before her co-defendant, Cornel McGee, went to trial and was acquitted. Judge Joel Boles sentenced Johnson on Friday to 11 months in jail, followed by 10 years of probation, a departure from the recommended minimum sentence of 13 years in prison. The two defendants — McGee, who was a driver at In His Arms Christian Academy in Pensacola, and Johnson, a teacher at the day care — left 3-year-old Jai’Nier Barnes in the day care center's van the morning of Aug. 18. The child was left inside the van for approximately four hours before another van driver went outside at around 1 p.m. to start the afternoon route and found the child in distress inside the vehicle. Employees started CPR and Jai’Nier was taken to an area hospital but died soon after of hyperthermia. 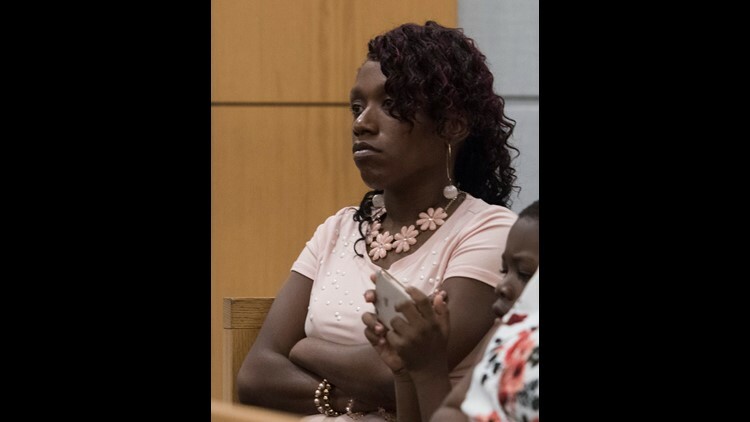 Louvenia Johnson waits for sentencing on Friday, Aug. 10, 2018, for her role in the death of Jai'Nier Barnes, who was left in a day care van in August 2017. Johnson received a sentence of 11 months in jail, followed by 10 years probation. Both Johnson and McGee had signed state-mandated transportation logs saying Jai’Nier had been taken off the van. After his trial, McGee told the News Journal in an exclusive interview that Johnson picked up each child and said their name and that he sat in the front seat, checking off each child as she did so. In this case, Johnson got distracted and put Jai’Nier down after saying her name, and then the child fell asleep. By state regulations, McGee also should have physically checked the back of the van to ensure no children were left behind. Prosecutor Trey Myers said during Friday's sentencing hearing that he doesn’t have a solid recommendation for what punishment the state is seeking. 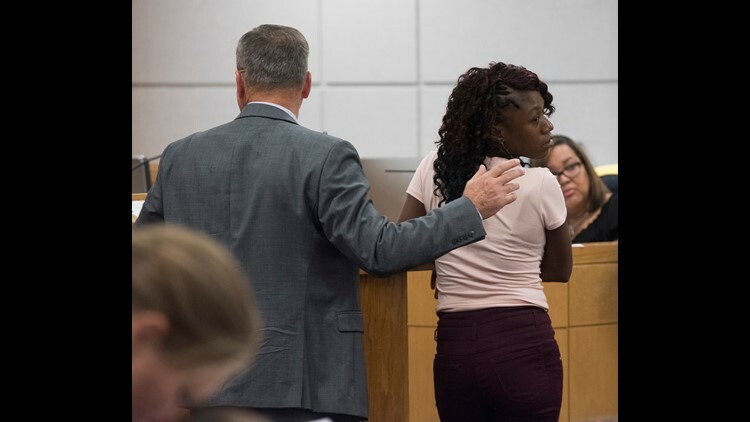 The case is the result of a tragic accident, he said, and while it's clear nobody intended to harm the child, Jai'Nier lost her life because of Johnson's mistake. Louvenia Johnson looks back and friends and family before her sentencing on Friday, Aug. 10, 2018, for her role in the death of Jai'Nier Barnes, who was left in a day care van in August 2017. Johnson received a sentence of 11 months in jail, followed by 10 years probation. “I don’t have an answer for what’s right ... . It’s become an epidemic of some nature and something has to be done to grab their attention, judge,” Myers said of the dozens of caregivers who have left children in hot vehicles so far this year. Johnson’s attorney, Paul Hamlin, said Jai’Nier’s death was a tragedy, and an isolated incident. He mentioned McGee’s case in his argument, saying he doesn’t believe it is right that his client should suffer more than her co-defendant did. Johnson has five children of her own and a limited criminal history. “This is just a terrible tragedy and I don’t know how you rectify that,” Hamlin said. The Escambia County Sheriff's Office investigates the death of a 3-year-old at In His Arms Christian Academy on Friday, Aug. 18, 2017. Families arrive on Friday, Aug. 18, 2017, to pick up their children from the In His Arms Christian Academy in Pensacola. A 3-year-old died at the day care facility, according to the Escambia County Sheriff's Office. Law enforcement investigates the death of a child at In His Arms Christian Academy on Friday, Aug. 18, 2017. Parents pick up their children Friday, Aug. 18, 2017, from In His Arms Christian Academy in Pensacola. Police are investigating the death of a 3-year-old at the day care. Police investigate the scene of a 3-year-old's death on Friday, Aug. 18, 2017, at In His Arms Christian Academy in Pensacola.